Simple design. Tailored cut. Extra layers where it counts. At Bummis, they love cloth diapers a lot. That being said, they know that at some point you’ll be happy to be done with them! The Potty Pant will be your little one’s trusty companion for the transition from changing table to big-kid potty. Looks like underwear – let your little one feel like a big kid! Easy on, easy off. Accidents? No problem. Two hidden absorbent layers where it counts. One layer of long loop cotton terry and one layer of microfiber. Training takes practice! The Potty Pant is absorbent and was designed to prevent leaks when accidents happen. It was not designed to be as absorbent as a diaper, so may not be appropriate at nap time or bed time for some big-kids-in-training. 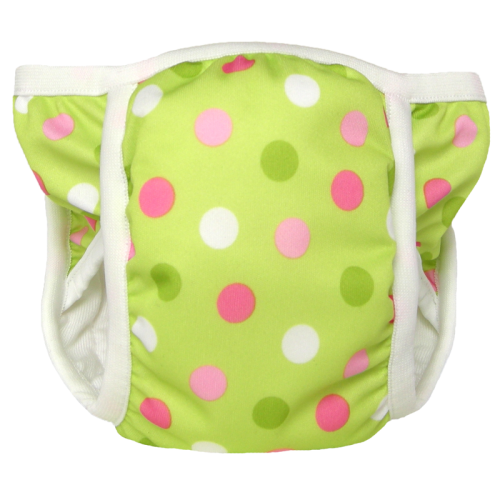 The Potty Pant is made with careful attention to detail in Bummis' own wonderful factory in the Montreal area, to assure good quality and fair labour practices. As much as possible, they use fabric and components that are sourced in North America. The products are guaranteed to be free of lead, phthalates and BPA.